The Scorpions will release an expanded edition of their latest album, “Return To Forever”, in North America on September 11. 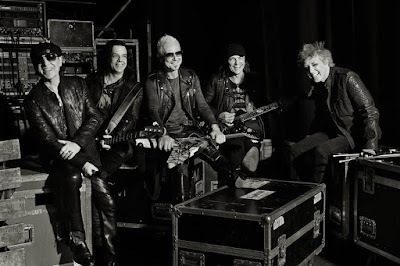 When singer Klaus Meine and guitarists Rudolf Schenker and Matthias Jabs conceived the album, the idea was to revisit their past, recording updated outtakes and unfinished song ideas from their most famous 80's sessions. "There had been quite a few unused songs over the years that were really good, but in the end didn't make the cut back then due to the limited space on vinyl,” explains Jabs. “We focused on eight songs, which were partly finished which we then recorded from scratch. During the work, new song ideas were added. “We were having so much fun we suddenly found ourselves in the middle of the songwriting process once again. And in the end, it turned out to be a brand-new Scorpions album after all." The expanded version will be released in sync with the start of the band's North American dates as part of their 50th anniversary tour, which opens in Boston on September 10. "We have been overwhelmed with the amazing response to our new album across the globe and can't wait to finally release Return To Forever in North America," says Meine. "We have always had such a special connection with our incredible fans and are so excited to get them the new album and return to play live this fall."